Foundeo has released 3 new Image Effects for ColdFusion 8! The first is sepia tone, you can see an example image to the left. Sepia tone was popular in the 1800's (used to give black and white photos a bit of color), but thanks to modern photoediting technology is making a comeback. I will be speaking at the New York City ColdFusion Users Group this Wednesday March 26th at 6:30pm. 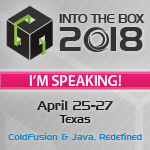 My topic is Image Manipulation in ColdFusion 8. You will learn how to manipulate and extract information from existing image files, and also how to create your own images from scratch.